Along with dreaming about posts instead of wrought iron, I can't help by get ahead of myself and picture the house sans wrought iron front door. I mean if you're de-wrought ironing the front, the door has to go too, right? I have been thinking about what style of door I'd replace it with. 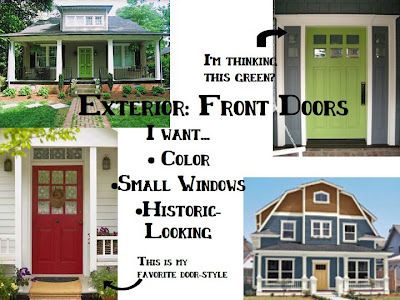 I am in love with colored front doors and also want something a little more classy. After a short amount of research (the unofficial, google image searching, couch sitting kind), I think I want a kiwi colored front door (like the two top ones) in the style of either the bottom left or top right. One thing I've been wondering about... I have always had a security door on my house. I have looked on my street and it is about 50/50 as to whether there is a security door or not. These cute doors just don't look as cute with a security door in front of them. What's a girl to do? Is it an essential? I've never been without a "security door" in front of the wooden door. I think if I had a solid wood door then i might perhaps be able to forgo the extra security, but I like having windows...so it's a tough one. And we all know in Memphis security is an obvious concern. I'd say if your new front door is solid and thick enough, you should try it without. Check out Gates, they're running a door special!